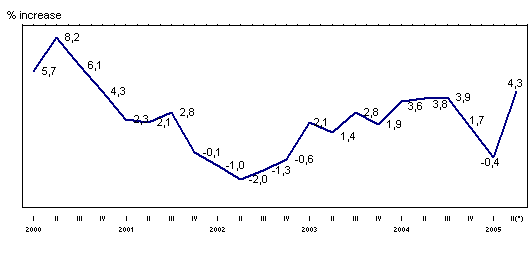 Industrial production in the A.C. of the Basque Country in April 2005 grew 4.3% with regard to the same month in 2004, in homogeneous terms of the working calendar, according to Eustat data. Over the whole of the first four months industrial activity grew 0.8% on the same period the previous year. In April 2005, compared with the previous month, industrial activity in the A.C. of the Basque Country rose to an inter-quarterly rate of 2.9%, once corrected for seasonal effects, thus marking an upturn in relation to the monthly registers of the first quarter. Sectorially, and a from the classification of large industrial sectors, the evolution of the index in April 2005 with regard to April 2004 presents growth for all sectors. Consumer Goods grew 6.8% due to the increases both in Durable Consumer Goods, and Non-Durable Consumer Goods (7.3% and 6.6%, respectively). Capital Goods grew 5.6% as an inter-annual rate, while Intermediate Goods increased by 2.9% and Energy 3.6%. Over the whole of the first four months of 2005 there was 3.8% growth in Capital Goods, Intermediate Goods did not vary at all over the period (0.0%), while Energy fell by 1.6%, and Consumer Goods dropped 1.2%, as a result of the fall experienced by Durable Consumer Goods (-1.4%) and Non-Durable Consumer Goods (-1.1%), all with regard to the first four months of 2004. The inter-monthly rate for April de 2005, on March 2005, was positive for all sectors except Capital Goods, which fell by 0.3%. Consumer Goods registered 7.,5% inter-monthly growth; among these, Durable Consumer Goods grew 8.0% on the previous month and Non-Durable Consumer Goods increased by 7.2%. Intermediate Goods rose 1.7% and Energy went up by 10.2%. By province, the inter-annual evolutions of the Industrial Production Index all increased, rising 1.5% in Alava, 5.2% in Bizkaia and 5.1% in Gipuzkoa. In the accumulated figure for the four months, Alava fell 1.8%, while Bizkaia and Gipuzkoa maintained positive rates, 1.4% for Bizkaia and 1.5% for Gipuzkoa. Inter-monthly growth rates, April 2005 on March the same year, for the provinces also showed positive results, growing 3.2% in Alava, 3.3% in Bizkaia and 2.2% in Gipuzkoa.